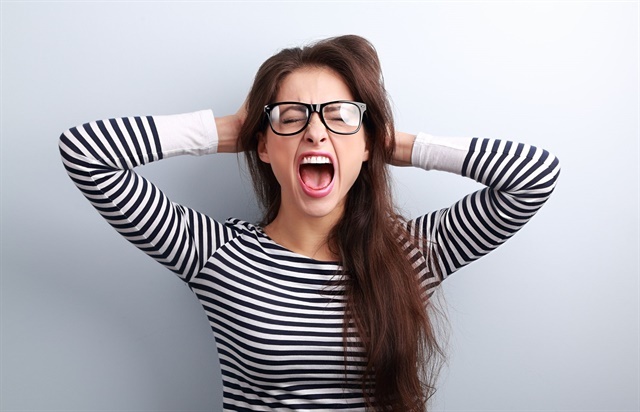 Use the Marie Kondo method of decluttering to tidy up your salon. If items don’t spark joy, thank them and discard them. Ever since the show Tidying Up With Marie Kondo came out on Netflix, the world has been swept up in decluttering mania. Although the KonMari method of tidying is about tackling your home, you can use this approach in your nail space. Commit yourself to tidying up. This means it isn't something you can just slot in between clients. Allocate a chunk of time in your calendar where you can dedicate yourself to the task. Imagine your ideal lifestyle. Think about how you want your space to feel and look when you are done. Finish discarding first. Completely clear out all your unwanted items before you start arranging and putting things away. And be sure to thank them for the joy they have brought you in the past. Tidy by category, not location. Don't just open that top drawer and start pulling items out. Carefully go through each of the categories of items one at a time. Don’t forget the famous key to the KonMari method. Ask yourself if the item you’re considering keeping or discarding sparks joy. Once you have set time aside and have a firm idea in your head of what you want the end goal to be, you need to figure out what categories apply to your space. The KonMari method has very defined categories to work your way through that don't really apply to us, but you can still take the approach and decide what is best for your items. 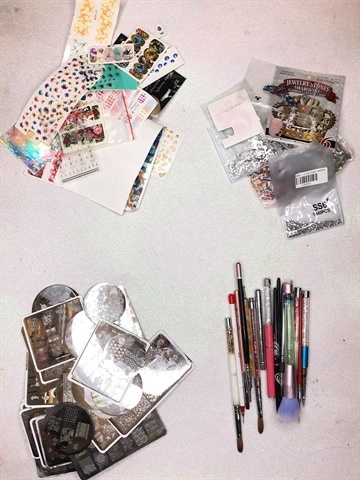 The categories I chose to tackle are: polishes (separating out gels, traditional polishes, and top and base coats), extension materials (acrylics, monomers, tips, forms, hard gels), nail art items (glitters, plates, foils, transfers, chromes), papers (old certificates, receipts, catalogs), what the method calls “Komono” (miscellaneous items), and sentimental items. Tackle only one category at a time. For each category, pull out every single item and hold each item and ask if it sparks joy. If not, thank it and discard. We all tend to hang onto every polish and nail art item we have ever bought, so you are bound to have more items than you can use on a regular basis. When you go through asking if particular items spark joy, consider whether they spark joy to use, rather than simply to look at. We all have those items that are just a little too annoying to work with, so we never reach for them. Thank them and let them go. With any other papers, like catalogs from suppliers, you need to consider if what they represent sparks joy. If not, time to recycle them! To reduce paper clutter, we like to take photos of items like reminder notes so they can be tossed but there is still a record. Dealing with miscellaneous items can be hard, as are sentimental items, like those personal knickknacks that have piled up or gifts received from clients. But focus on what to keep rather than what to discard. If they spark joy for you, find a home for them or put them on display. But if they no longer spark joy, or the joy was in receiving them as a gift, thank them for a job well done and let them go. There are a few things to think about when it comes to discarding items. If it is something of value, like a lamp or dust extractor, you can always resell it. There are many Facebook groups dedicated to reselling items, but you can also try eBay or classifieds like Craigslist. If it’s something of little value but still useable, like nail polish, local charities like women’s shelters will always welcome donations. And if it is beyond rescue, make sure you dispose of it properly. Never pour chemicals down the sink or throw them into the trash. Once you’re through discarding, you can work on how you want everything you keep to be put away. Kondo has special folding techniques so you can see all your clothes, but the same applies for your nail items. Put all your glitters into matching jars and if they are going into a drawer, lay them on their side. Use swatch rings on your polish bottles to easily identify colors. If your acrylics have a plain lid, put a small dot of the acrylic on top. 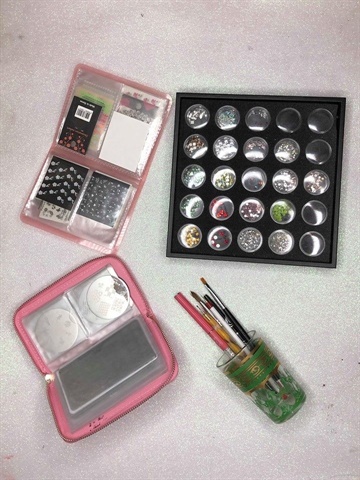 Invest in a holder for your all stamping plates so you can easily flick through designs. It’s also helpful to have designated homes for all your items, like the iconic Helmer from Ikea, that can have drawer liners to keep items in place or baskets in each drawer. Although it isn’t part of this method, it’s a great opportunity to make sure everything is clean and sanitized as your put your items away. Wipe the bottle necks, clean and condition brushes, remove polish from silicone mats, and give everything a good dusting! Victoria Thorp is a journalist-turned-nail technician from Australia who dedicates all her time to writing about and creating nail art. You can find her blog at www.onemorecoat.com.